Oceanside, California offers triathletes a chance to race in the region that birthed the sport in the early 1970s in Mission Bay. Oceanside is located at the northern end of San Diego's North County, which includes the beach communities of Del Mar, Cardiff, Encinitas, and Carlsbad—home to surf, triathlon, and beach culture. 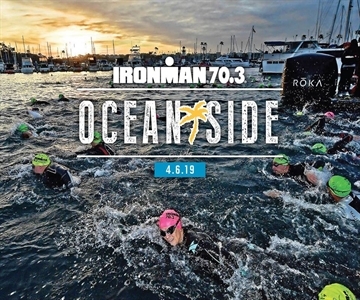 The 2019 IRONMAN 70.3 Oceanside will offer 40 qualifying slots to the 2019 IRONMAN 70.3 World Championship in Nice, France. Professionals compete for $50,000 prize purse plus W/C Slots.